According to the recent study conducted by Transparency Market Research (TMR), the global acrylamide market is likely to surge at an overwhelming CAGR during the forecast period (2017-2022) to reach a valuation of US$ 4,776.8 Mn. Increasing use of the product in the water filtration and cleansing procedures is propelling its global sales. Moreover, enforcement of stricter environmental laws related to efficient disposal of wastewater is likely to make a positive impact on the growth of the global market for acrylamide over the next couple of years. The product in also being extensively used in various oil and gas processing application. In addition, expansion of the petroleum sector is expected to make a positive impact on the demand for acrylamide in the forthcoming years. As the same time, acrylamide is also witnessing a substantial rise in demand from the food and beverage industry. Also, factors such as rising consumption of convenience food and changing lifestyle are expected to reflect favourably on the growth of the global market for acrylamide throughout the assessment period. In recent years, the acrylamide has emerged as key ingredient in various medical products including personal care, cosmetics and wellness products. Hence increasing application of acrylamide in medical product manufacturing is anticipated to support the growth of the market in the years to come. There has been a significant increase in the use of acrylamide in adhesive and sealants manufacturing. On the flipside, increasing availability of better alternatives is likely to pose a threat to the market’s growth during the assessment period. Furthermore, excessive intake or exposure to product through eatables and tobacco smoke can cause issues to the health. The aforementioned factors are likely to play a pivotal role in the shaping the dynamics of the global market for acrylamide over the projection period. 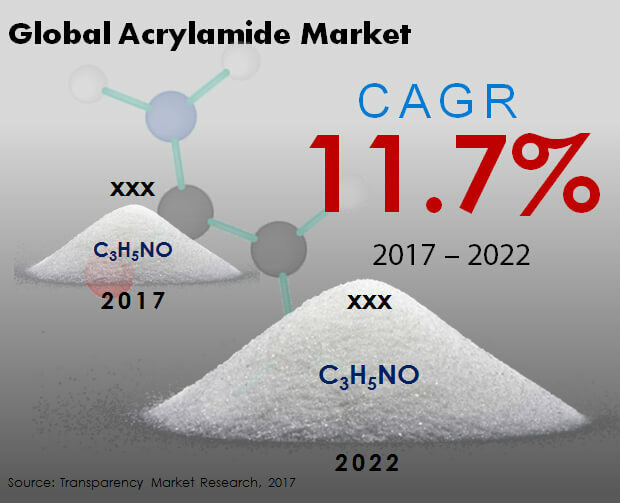 Acrylamide market in Asia-Pacific excluding Japan region is projected to remain dominant throughout the forecast period. In addition, the region’s market is set to witness a robust CAGR during 2017 to 2022. The growth of the market in APEJ is primarily characterized by factors such as changing lifestyle and growing disposable income. Based on application, acrylamide will continue to find robust application in waste and wastewater treatment during the forecast period. Each year, a significant percentage of the acrylamide produced globally is used of treating waste water. By the end of 2022, more than US$ 1,600 Mn worth acrylamide is expected to be used for treating waste water. Base on physical form, demand for solution based acrylamide is will continue to outsell solid crystalline through the projected period. Global sales of solution based acrylamide currently account for over two-third revenue share of the market. Further, revenues from global sales of solution based acrylamide is projected to increase at a significant pace over 2022. By process catalyst, the microbial catalyst process will register higher preference during the forecast period. More than US$ 3,600 Mn worth acrylamides will be utilised through microbial catalyst process. Anhui Jucheng Fine Chemicals Co.Ltd., BASF SE, SNF Group, Beijing Henjiu Chemical Group Corporation, Jiangxi Changjiu Agrochemical Co., Ltd, Ashland, Mitsui Chemicals, Inc., Kemira Oyj, Dia-Nitrix Co., Ltd., and Ecolab Inc. are among the top companies functioning in the global market for acrylamide.